Drama is an excellent tool for change in that it challenges perception and allows individuals to explore reality in a safe space where actions and consequences can be examined in detail. It can help to prepare young minds for the real world and the many issues that they may face. It allows people to communicate, learn and understand their own and others feelings and experience reality without the pitfalls. It can also help to develop tolerance and a real and deep sense of empathy. Seeing how the world looks through someone else’s eyes can be an effective way of understanding another’s point of view. Possibly something that we need more of in our society. The majority of young people in my drama lesson today were brown and black and my heart was heavy when I saw them because I fear for their future. Due to my concerns about events that have happened recently in the US and even right here on our own doorstep in the UK I decided it was time to act. No amount of hashtags and calls for justice being made behind a computer or phone screen is going to alter the fact that one of my students could be the next victim. I wanted them to understand the dangers that they may face and understand the importance of choice, choosing their battles wisely and the consequences of injustice. Many people are now asking what we are prepared to do about the consistent senseless killings of young men and women, in particular people of colour who are dying at the very hands of those who swore an oath to protect them. I chose to act because it is the duty of every one of us to safeguard our young people. They are angry, they are hurting, they are confused and they are calling for justice. Social media is encouraging individuals to take justice into their own hands instead of educating them about the problems and providing effective long term means to solutions. Vengeance will be the death of all of us if we continue to raise our children to be filled with hate, if we continue to show them that two wrongs make a right, if we continue to force them to watch videos of our brothers and sisters being killed. Put down the phones and pick up a book. Show our young people that in order to be heard they must build their own platform. That platform is built on a solid and effective education and a strong family unit. One can only fight injustice with knowledge, intellect, hope, unity and prayer. I will continue to pray for our young people in the hopes that this unrest that we face is put to rest and energies are instead put into tackling the cause with effective and peaceful solutions. I am mum to a 12 year old daughter, 8 year old son and a one year old son. I am concerned for their safety given the number of high profile cases of cruelty against people of colour at the hands of the very people being paid (by our taxes!) to protect them. Many of your Police officers seem to think that they have the right to do wrong, based on the skin colour of the person that they are dealing with. Society dictates that we should live within a hierarchical system determined solely by the colour of one’s skin. The lighter you are, the more privilege you have. But I think that by now, in 2015, it is common knowledge that beneath our skin, we are all the same, our hearts beat the same, our blood runs through our veins the same and we all qualify for equal opportunities. And yet between, 2014-15, seventeen people of colour died in Custody. Recent figures also reveal that the number of people dying in police custody has reached its highest level for five years. A recent independent review announced by Home Secretary Theresa May, could go some way towards exposing what’s really going on; though given past experience of injustice I highly doubt it. The constant evasiveness and obstructions to justice displayed by some members of the Police force has so far paid off in your favour. But surely you must now see that times are changing. Social media and camera phones are now exposing much of what has to this day been hidden. People are waking up to the hypocrisy and dangerous behaviour displayed by some members of the force. It has become painfully clear that there seems to be a pattern of unjust heavy handed, highly violent and callous interactions between the Police and Citizens, particularly people of colour. So please can you explain to me why people of colour are still being persecuted by ignorant and racist Police Officers, why people of colour make up a disproportionate percentage of the number of people in Prison and in some cases for minor offences that others would most likely get away with, or why citizens are still dying in custody and also why no Police Officer has ever been brought to justice over the mistreatment of people who have suffered an injustice at the hands of the Police. How much longer will this and the next generation have to keep fighting for justice that they should be freely entitled to? When will Society finally catch on to the fact that we are human first? My colour should not dictate how far I get on in life or whether I live or die as a result of a minor traffic violation (RIP Sandra Bland). I am sick and tired of hearing about victims who have suffered unjustly at the hands of the Police at home and abroad. To me it’s pretty simple. Wear your badge with honour, perform your duties with honour and honour the whole community that you serve. If corruption and cover ups be the food of your soul, then let justice starve you until you start to eat right. I would appreciate a response from you so that I can sit my three children down and explain to them the future that they may have to face at the hands of your officers. I think they deserve to know your truth so this is your opportunity to explain yourself and maybe even be accountable to the actions of some of your gang members. Media outlets! Where were you?! How does a peaceful march attended by thousands of people in London slip by almost unnoticed? Over three thousand people are estimated to have marched in support of reparations for Maafa (African enslavement) last weekend and yet no mainstream media outlets chose to cover it? The first thing I find myself asking is why? Though the answer may well be obvious to many, it still makes me wonder why, in 2015, thousands of people of colour march to Parliament in peace to raise awareness of a serious matter that is clearly of public interest given the huge numbers of people possible affected; but no major newspaper or radio station thought it was worth a mention. So why were the views and the concerns of these British citizens widely ignored? 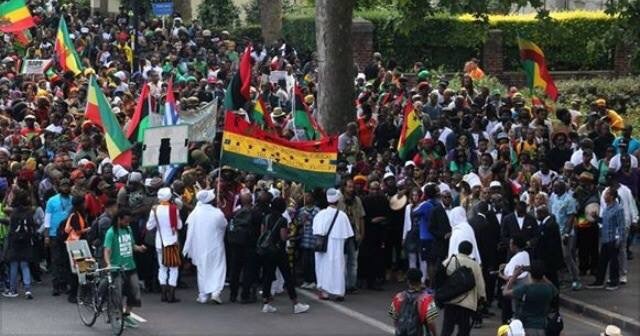 This peaceful march, filled with drumming, chanting and positive vibes was given a wide berth simply because the prejudices that were apparent back in the days of slavery are unfortunately still at the heart of many British institutions. Is this simply a race issue? In my opinion, yes it is. Will any media outlets ever admit that they don’t really care about what matters to people of colour? Of course not! They will only care if one of us has committed a crime or if the march had descended into chaos and violence. Until recently, I produced a specialist BBC Local radio show which covers stories that matter to the African and Caribbean community. My final show, a week before the reparations march saw a group of Rasta’s come in to perform a live groundation (Spiritual chanting and drumming) and to raise awareness of the upcoming march. I saw it as my duty to ensure this event received coverage. I did also wonder if anyone else would be brave enough to broadcast anything about it. The thousands, who attended the march, did so following a successful social media, mobile platform and community radio campaign led by grass roots activists and campaigners. I view this to be a major achievement and ground-breaking in terms of unifying the black community for something other than a carnival, wedding or funeral. What was even more poignant about this event was the petition handed in to parliament by a delegation of community representatives including Sis Jendayi Serwah, Sis Esther Stanford-Xosei, Mama Lindiwe Tsele, Sis Natoya Smith and brothers Kweme Abubaka and Jabari Sekou. It was titled ‘Stop the Maangamizi: We Charge Genocide/Ecocide’ requesting an All-Party Commission of Inquiry for Truth & Reparatory Justice to Downing Street. Now all we need to do is to stop the media from blatantly ignoring the needs of the black community. In particular, the broadcasters who force us to pay a TV license should be held to account for choosing to ignore the concerns of the community in which it is supposed to serve.